SI-SCOPE is an advanced RS232 Analyzer that will save you hours of troubleshooting by allowing you to tap into any RS232 line and instantly examine all data flows, signal changes, and line status errors. SI-SCOPE is the most complete RS232 Analyzer available offering you both Async and Spy Mode operation and comes with the choice of two cabling options, our classic dual RS232 port Passive Monitoring Cable, or our next generation Ultra-Tap USB cable. How Does SI-SCOPE Analyze an RS232 Circuit? 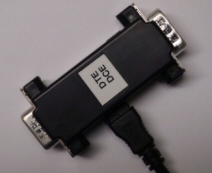 In Async mode SI-SCOPE monitors bidirectional communications by tapping the RS232 circuit with a special monitoring cable. SI-SCOPE comes with either our dual port Passive Monitoring Cable or our new Ultra-Tap USB interface cable. The diagram to the right illustrates how the dual port Passive Monitoring Cable (PMC) operates. When RS232 data is transmitted from one device to the other the data is routed into the SI-SCOPE PC while being transmitted to the receiving device. All RS232 data, error conditions, and signal changes are recorded and time stamped at the interrupt level by SI-SCOPE'S PMC device drivers. SI-SCOPE'S interrupt driven design guarantees that the sequence of events are correctly maintained and the time between the events is accurately measured. SI-SCOPE's PMC drivers support PCI, PCIe, PCMCIA, and ExpressCards under Windows 7 (x86/x64), Vista (x86/x64), XP, 2000, NT, ME, 98, and 95. Ultra-Tap is our next generation cable design for bidirectional RS232 monitoring that eliminates the need for two dedicated serial communication ports. Ultra-Tap is an embedded RS232 monitor in a small hand held form factor that connects to your PC or laptop's USB port. Ultra-Tap's embedded hardware manages the capture	and time stamping of all RS232 data, signal changes, and error conditions for baud rates up to 921600 bps. SI-SCOPE'S Ultra-Tap drivers manage the USB interface and guarantee that all captured RS232 events are displayed in the proper sequence and that event timing is accurately maintained. SI-SCOPE's Ultra-Tap's drivers are compatible with Windows 7 (x86/x64) Vista (x86/x64), XP, and Windows 2000. SI-SCOPE also has the ability to operate in Spy Mode. Spy mode is a software only solution that does not require any special cabling or dedicated ports. In Spy mode SI-SCOPE will insert a special kernel mode driver into the Windows driver stack and silently monitor all the activity between any Windows program and an external RS232 device. Spy mode will work with any port enumerated by the Windows serial driver including internal PCI modems and USB serial devices. Spy mode supports Windows7 (x86/x64), Vista (x86/x64), XP, and 2000. Very easy! Unlike similar products with complicated interfaces SI-SCOPE's user interface requires little or no learning curve. You can be productive with it out of the box and refer to the online help when needed. SI-SCOPE's interface was designed to maximize the amount of serial data displayed while making it easy to see at a glance the source of the data. All data events, signal changes, and line status errors are time tagged and can be searched on in the review window. Will SI-SCOPE Work For Me? We guarantee it! If during the first 30 days you are not completely satisfied with SI-SCOPE you can return it for a refund. Async mode support for Windows7(x86/x64), Vista(x86/x64), XP, 2000, NT, ME, 98, and 95. Time stamps included on every event with millisecond resolution. Fully configurable RS232 parameters with support for baud rates up to 921600 bps. Control signals (DTR, RTS, DCD, DSR, CTS, and RI) are recorded and time	stamped allowing you to analyze where and when signal changes occur. Line status errors can be recorded and time stamped allowing you to see precisely which device generated the error and when the error was detected. File Capture option records data to disk as it is captured. Included conversion program exports a captured session into a binary (record format included in documentation) or ASCII text file format. ASCII format allows for user defined field delimiters for easy integration into third party word processing and spread sheet programs. For long analyzer sessions the capture file can be automatically archived at a user defined time each day. Capture file can be saved and reloaded into SI-SCOPE for review at a later time. Programmable triggers allow you to activate and deactivate data capture based on incoming data streams. Wildcards are supported! Terminal mode allows you to send data to the device under test from the keyboard and observe responses. Programmable macros allow complex data sequences to be transmitted at the touch of a key. ASCII charts, popup rulers, and time cursors provide the tools you need to analyze serial protocols. Search Engine can scan through captured data for any data pattern, signal change, or error condition. Spy mode for cable free debugging under Windows7 (x86/x64), Vista (x86/x64), XP, and 2000. Included cable (PMC or UTC) taps any RS232 link allowing for bidirectional monitoring of all data and control signals. 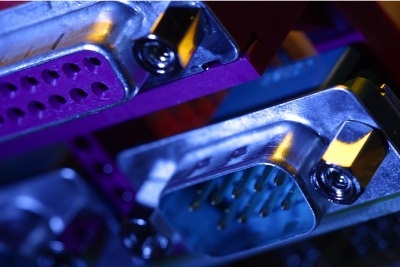 Dual Port Passive Monitoring Cable (PMC) supports PCI, PCMCIA, and PCIe ExpressCard devices. USB serial converters are also supported. Please read our FAQ if you plan on using a USB converter. Supports half duplex RS485 communications analysis and 9 bit protocols when used with an RS485 converter. Comprehensive online manual included in both Windows Help and Adobe PDF format. SI-SCOPE RS232 Analyzer with Ultra-Tap Software on CD media with Ultra-Tap USB interface cable. Our legacy DOS version is included on the CD at no extra cost. 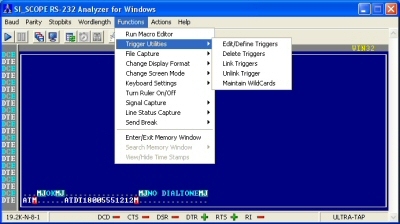 SI-SCOPE RS232 Analyzer Download Edition. Available for immediate download. You will need to assemble the dual port passive monitoring cable using the included documentation.